In the first match of the Commonwealth Bank Series 2011-12, a tri-nation tournament, Australia beats India by 65 runs. The match was reduced to 32 overs each team due to obstacles by rain in the match. A detailed information about the match is given in this article. In the rain affected opening ODI (One Day International) match of the Commonwealth Bank Series 2011/12, Australia defeated India by 65 runs after the match was reduced to 32 over innings. In this tri-nation ODI tournament where India faced Australia in the first match of the tournament. The other team of the tournament is Sri Lanka. At Melbourne Cricket Ground, Australia after loosing toss was on 2 for 35 after 11, fought back with the help of brilliant hitting by Hussey brothers and a well played inning by opener Matthew Wade. In reply, Indian batsman once again failed to tackle Australian bowlers. This time Clint McKay was the man who strikes with the bowl. He gave India a double blow in his very first over which make the match in Australia's favour. The inclusion of only two seamers in Indian side was also a great factor in India's loss as the Indian spinners has given away too many runs to the opposition. Client McKay was selected as the Man of the Match for his brilliant bowling performance. Indian captain Mahendra Singh Dhoni won the toss and elected to field as he was expecting rain later in the day. His decision worked as their only two seamers Praveen Kumar and Vinay Kumar bowled well before the rain came after 11 overs of Australian innings. Australian were on 2 for 35 at that moment. Vinay was the man who took both the wickets. But after the match was resumed and Indian spinners were on, opener Matthew Wade and Michael Hussey played some good shots and accelerated the run-rate. But it was brutal hitting by David Hussey which sets a difficult total for India to chase. He strucks three huge sixes and 4 fours in his 30 ball 61 runs. 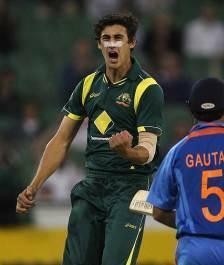 India too loose early wickets as both openers Sachin Tendulkar and Gautam Gambhir were removed by Mitchell Starc. Virat Kohli and Rohit Sharma tried to build a partenership, but McKay strikes twice in his first over and leaves India under pressure. From here Indian didn't recovered and were all out in 30th for 151 runs, 65 short of the target. McKay took four wickets for just 20 runs. Australian fielding was also electric. Daniel Christian runs out Ashiwn with a great effort and Ricky Ponting was also involved in a superb catch of well settled Virat Kohli. Tri-series between the India, Australia and Srilanka is started on 5th of February 2012 in Australia. The most peculiar thing about the commonwealth bank series is that all the matches will be day night. Here, I am giving the detail of the schedule of this commonwealth bank tri-series.